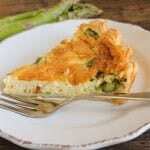 Easy Cheesy Asparagus Quiche is a delicious tasty Spring time recipe, perfect for lunch, dinner and even brunch, serve with a salad and Dinner is served. of the spear, where the stem starts to turn tender. Keep only the tender part. Chop into 1/4 inch (3/4 centimeter) sizes. Boil or steam for approximately 10 minutes. Drain and set aside. In a 10 inch (26 centimeter) pie plate, place the pre made (or homemade) pie pastry, brush with melted butter, and spread the steamed asparagus on top. In a medium bowl, whisk together eggs, cream, milk and salt, stir in grated cheese. Pour mixture over the asparagus. Bake for 15 minutes then turn oven down to 325° (160° celsius) and bake approximately 30 minutes more. Quiche will be cooked when a knife inserted comes out clean. Let stand 5-10 minutes before serving. Enjoy!